If you are travelling from Rome using public transport - and most people will be, be prepared to get a little out of your comfort zone - especially if you speak little or no Italian. Also, be prepared to absorb some truly stunning scenery. EYE SPY - Keep an eye out for the absolutely stunning waterfall that pours out of the middle of the Tivoli hill top! You will begin to see it after coming out of the first tunnel. To start your journey, you first travel to Tivoli, and while you are there DO NOT miss the opportunity of views the truly awesome renaissance gardens at Villa D'Este. You have to virtually walk past it anyway. Tivoli is a good 36 miles away from the center of Rome, so you are going to have to catch a train. The easiest way to get to the train station is by using the metro. To begin with, make your way to the Terminus station as you will need to catch a tube travelling on the Linnea A line towardsREBIBBIA. Get off at TIBERTINA station and make your way to a ticket booth to pick up tickets for the overland train to TIVOLI. You can pick up return tickets at this point although you can always get some more at Tivoli train station. Two return tickets to Tivoli from Tibernia will cost 9 Euro. I know this seems far too cheap, but that was what I was charged last week - the ticket seller may have undercharged me by mistake. The journey to Tivoli will take about an hour, but once you get out into the country the scenery is beautiful. When you reach Tivoli station, avoid the temptation to follow the road that leads down to the right. Instead just walk a short distance down the road and cut through to a path on the left that will lead you down to a modern 3 span bridge that stretches across the river. 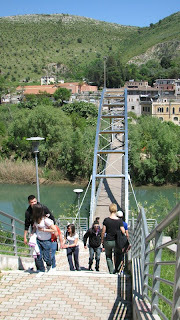 Cross the bridge to reach the town then follow the plentiful and well posted signs to Villa D’Este. To walk from Tivoli station to Villa D'Este will take between 10 and 15 minutes. It is very easy and will save you from trying to catch a bus as well as finding somewhere that can sell you a bus ticket - as well as avoiding the risk of getting on the wrong bus (or the right bus but going in the wrong direction). 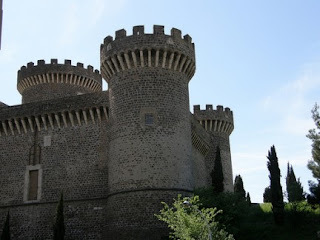 You will know that you are heading in the right direction as soon as you walk past the fortified castle. A bit further along and you will come across a square/municipal park with an old clock tower set behind it. 2. 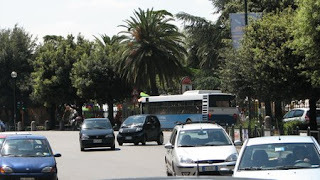 Get the bus to Villa Adriana. To get to Villa Adriana from here you will need to get bus tickets from the nearest tobacconist. We got ours from the Pizza shop from across the street. WARNING! You must get yourself return tickets otherwise you will not be able to get the bus back - and the drivers will NOT let you on without a ticket. You can try bribing them if there is no one on the bus to witness, but it is your risk. Bus tickets are 1 Euro each so that is two tickets, two Euros each. This is so, so much easier than trying to sort out tickets down at Villa Adriana. Facing the main road as it leads down the hill the bus stop is on the right hand side. You need the number 4 Bus - it will the blue and while one (may also have a bit off yellow on it too). The bus will take you all the way to Villa Adriana and - if you ask the driver nicely - will drop you of outside the main entrance. The ticket booth for Villa Adriana will be on the left. When you are ready to come back, be aware that the bus is unlikely to stop and collect you at the main entrance. You will need to walk up the road out of Villa Adriana to the next bus stop that is about 300 meters on the left. Wait for the next blue and white bus and check with the driver that he is going to Tivoli train station. Get off when you see the three span bridge.